Disasters raise serious challenges for contemporary legal orders: they demand significant management, but usually amidst massive disruption to the normal functioning of state authority and society. When dealing with disasters, law has traditionally focused on contingency planning and recovery. More recently, however, ‘resilience’ has emerged as a key concept in effective disaster management policies and strategies, aiming at minimising the impact of events, so that the normal functioning of society and the state can be preserved. 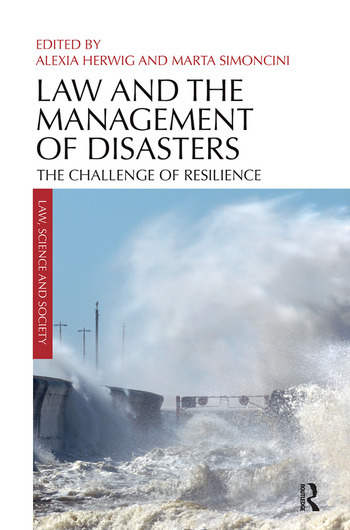 This book analyses the contribution of law to resilience building by looking at law’s role in the different phases of the disaster regulatory process: risk assessment, risk management, emergency intervention, and recovery. More specifically, it addresses how law can effectively contribute to resilience-oriented distaster management policies, and what legal instruments can support effective resilience-building. Alexia Herwig & Marta Simoncini are both based at the Centre for Law and Cosmopolitan Values, at the University of Antwerp, Belgium.